San Francisco dwellers, specifically those living in the western parts of the city, have a secondary name for their locale. They call it Portland because it’s not uncommon to step outside and see foggy skies casting their doom and gloom on the neighborhood. But take a 15 minute drive east and the skies are a shade of crystal blue, the fog nothing but a splotch in the rear-view mirror. Due to the 124 Spider’s roofless nature, the east is where we decided to spend our week with Fiat’s newest roadster. 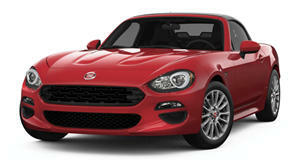 The first thing to note about the Fiat 124 Spider is that it’s not really a Fiat. Dig just beneath the skin and you’ll find a Mazda MX-5 wearing Italian clothes. Aside from the size and interior, it looks nothing like the MX-5. This is, after all, Fiat’s best crack at modernizing the original Pininfarina-derived 1966 Fiat 124 Spider and considering the regulatory hoops it had to jump through to sell it in 2017, this interpretation looks fairly close—the front and rear end bearing the most resemblance to the old roadster. Suffice it to say, it turns heads in traffic, especially with the top down and speakers blaring Van Halen’s “Panama” as if they were trying to drown out the 1.4-liter turbocharged MultiAir engine. It’s not like there’s much noise to drown out in the first place. Without the Abarth box ticked off—a package that adds a limited-slip differential, four horsepower, and a sport-tuned exhaust—the best way to enjoy the engine’s music is with the top and windows down, stereo off, and driving on a long winding road where the turbocharger can hiss as it spools into oblivion. That turbo allows the engine, one of the few components not built in Mazda’s Hiroshima, Japan factory, to make 160 horsepower despite trailing the MX-5’s four-cylinder by 0.6-liters. Downsizing is the way Fiat chose extract better fuel economy out of the 2,500 pound roadster, however we only saw 20.5 mpg on the readout, far below the 29 mpg advertised (25 city, 36 highway). Part of the reason for the dismal economy has to do with the Fiat’s lack of a top and the gorgeous road conditions on our local mountain pass. Without any reservations, the slightest nudge of temptation had us fiddling with the latch for the manual folding top (putting it down takes 5 seconds…literally) and cuing up a playlist best suited for opposite lock before heading out for a drive. Just like the MX-5, the 124 Spider is in its element here, and despite the fact our tester was fitted with the six-speed automatic rather than the manual, the driving experience is almost as raw as that of the MX-5…almost. You see, Mazda loves clever styling, and while the Italians are masters of the design pen, some of the Miata is lost in the pursuit of bellezza, or beauty. For example, the Fiat’s long hood does away with the downward sloping front end on the Mazda. It may seem like an arbitrary thing, but Mazda designers put that in the MX-5 because it brings the driver's center of focus downwards. With focus closer to the road where the white lines pass near the driver’s line of sight, 30 mph feels like 50 in the MX-5 but only 40 in the Fiat—it’s small size, light body, and thin sound insulation (left to a minimum to reduce weight, sharpen the driving experience, and inadvertently make the 124 less of a grand tourer) making the driver feel connected to the road, though not quite emulating a street-legal go-kart like the MX-5. For that, drivers can also thank the softened suspension. Though the 124 Spider shares the same 205/45R 17 tires with the Miata to preserve grip through the corners, this is not a car that lives on the knife’s edge at high speeds. Take it on the winding roads past 75 mph and confidence drains as quickly as the fuel tank, sending the driver reaching for the brakes as soon as they find that roll angle seems to correspond to steering angle. It’s still massive fun and tactical enough to help a driver refine their skills without being at the caustic helm of a high output engine, but there’s an ominous feeling that an owner who buys the 124 Spider for the purpose of hooliganry would soon be left wanting more.